ScriptRunner audit log helps you to inspect the script configuration changes made by the users. The audit log service logs add, edit or delete operation for ScriptRunner scripts as part of application audit log. The service also logs execution of built-in scripts that could potentially change the system. To avoid swamping the audit log, the service does not log activities where scripts read data from the system rather than changing the configurations. Also, the service does not monitor JIRA workflow modification activities as JIRA already has its own mechanism in place to log such changes. 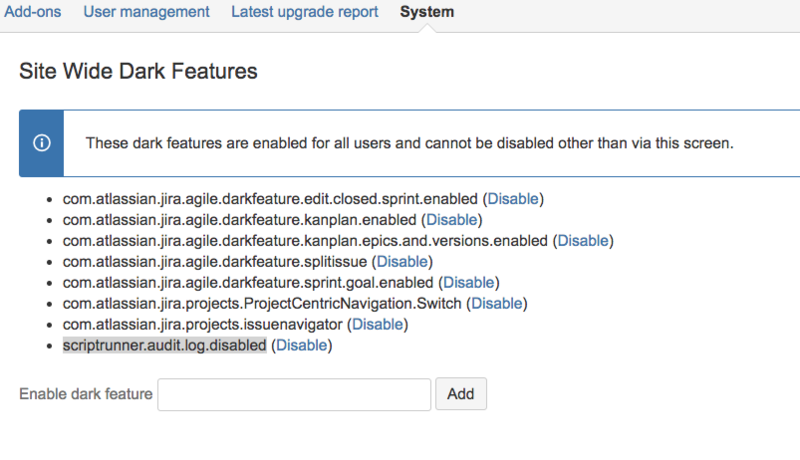 ScriptRunner audit logging is enabled by default since ScriptRunner v5.3.8 as part of JIRA audit log. You must be a JIRA administrator to view the JIRA audit log. Navigate to System →Audit Log to view the audit log. The Summary field appends with 'ScriptRunner' for the ScriptRunner audit log entry. The screenshot below is an example of how the ScriptRunner audit log entries looks like in JIRA audit log. You won’t be able to inspect ScriptRunner script configuration changes if the audit logging is disabled. We highly discourage to disable ScriptRunner audit logging mechanism unless you have a strong reason. Locate scriptrunner.audit.log.disabled key and select (Disable) link on the right side of the key. This should remove the scriptrunner.audit.log.disabled key from the list.